Impact Wrestling has added four matches to the card for their WrestleMania week show with Lucha Underground. 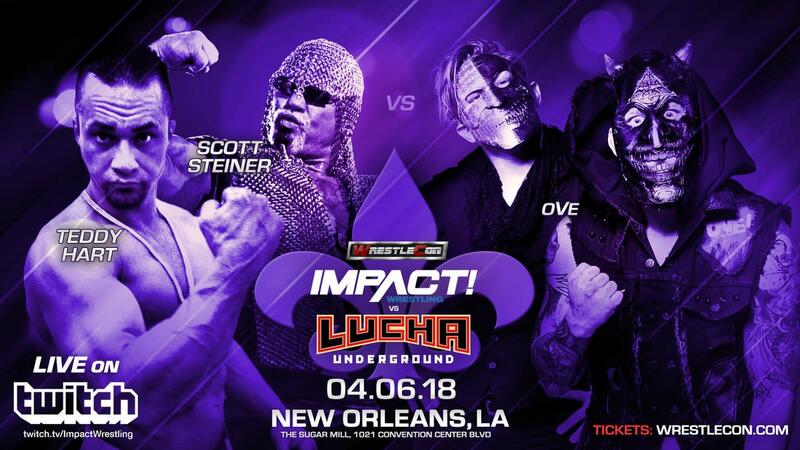 It had been known that Scott Steiner and Teddy Hart would be appearing at the event, and Impact revealed today that they'll be teaming together against Dave & Jake Crist. Brian Cage vs. Eli Drake, Trevor Lee vs. Famous B, and Matt Sydal vs. Caleb Konley vs. Moose vs. Chavo Guerrero Jr. vs. Jack Evans vs. Matanza Cueto (Jeff Cobb) in a six-way have also been announced for the card. The theme of the show is Impact vs. Lucha Underground. It's taking place at The Sugar Mill in New Orleans on Friday night and will air live on Impact's Twitch channel at 10 p.m. Eastern time. Austin Aries & Fenix vs. Alberto El Patron & Pentagon Jr., Eddie Edwards vs. Jeremiah Crane (Sami Callihan) in an I Quit match, Knockouts Champion Allie defending against Taya Valkyrie, Impact Tag Team Champions LAX (Santana & Ortiz) defending against Killshot (Shane Strickland) & The Mack (Willie Mack), and Andrew Everett, Dezmond Xavier & DJZ vs. King Cuerno, Aerostar & Drago are the matches that had already been announced for Impact vs. Lucha Underground before today's additions.